Custom photo mug from York Photo, just pay $5.99 shipping. Cute gift for Dad or a Grandparent, put pictures of the kids on it or your fur baby!!! So many Amazon deals, here's a few of my favorites! The last few years I've done the majority of my shopping online and it's the best thing ever. Super cute for littles, $23.99 Lightening Deal! Almost time for holiday baking...quick, easy test to see if your baking powder is still good. If the baking powder in your cupboard hasn't been used since last holiday baking season you might want to test it out to see if it's still good. Baking powder can lose potency over time, there is a simple test you can do to see if yours is still good for baking. Put 1/2 a teaspoon of the baking powder in a small bowl, pour in 1/4 cup hot tap water. The more bubbles the fresher the baking powder, you want lots of activity otherwise dough won't rise sufficiently. If you're not sure what lots of activity looks like, try this test the first time on a fresh container so you can see what good activity looks like. I tested mine so I could take the picture, very few bubbles so I need to toss it and start fresh, I should have known, the last few times I made cookies they turned out strange looking and kind of sunken in. Grab this HOT Starbucks Groupon Deal. $5 for a $10 Starbucks Card, awesome Teacher gift or gift yourself. 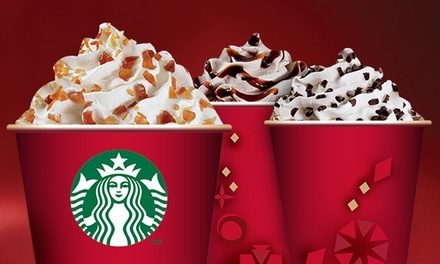 $5 for $10 Starbucks Gift Card. No strings attached, no credit card required I promise, just a Free 1 Year digital subscription to Shape Magazine, read it on your phone or tablet......click on the banner below to sign up.